Some doors are harder to forget than others, and the turquoise enamel certainly makes these double exterior doors more unforgettable. Despite the garish color, these classic panel doors have fabulous detailing. Each panel is trimmed by bolection, a type of raised molding that is typical of panel doors. This type of molding is difficult to clean, which could be a drawback when considering this type of door for the exterior of a building. Within each panel, decorative raised panels shaped like flat-topped pyramids are arranged in the corners of each panel, giving it an Art Deco feel. Only one door has a brass handle set with a matching face plate and lock. 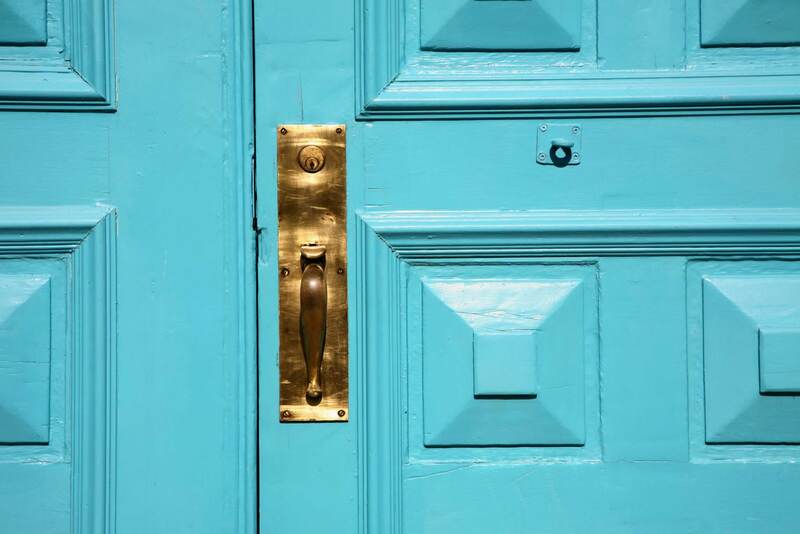 The only other hardware is an eye bolt on a mounting bracket, or plate, that has been painted turquoise to match the door and was mostly likely used with a robe or other cord to tether the door open.